This is my first blog post. I submitted this for the Sunday Funday challenge by David Cowen. It is just a beginning of my learning Mac forensics, and I plan to continue doing more. I would like to express my sincere thanks to Dave for encouraging to learn new things, Sarah for the great research and Phill for guiding me to start this blog. This is a great community I would like to be and proud to be part of. On OSX Mojave, what information can you determine from the KnowledgeC database? Sarah Edwards has done quite an extensive research on the knowledgeC database and wrote a few posts on her blog mac4n6.com. I have never used a Mac before and this is a good opportunity to learn Mac forensics. So, I decided to take the challenge and installed a macOS Mojave in Virtual Box. As a beginner I simply followed the same testing that Sarah did on macOS 10.13 to see the output of macOS 10.14 Mojave. On macOS 10.14 Mojave, the knowledgeC.db database is found in the same locations as the previous version, macOS 10.13. 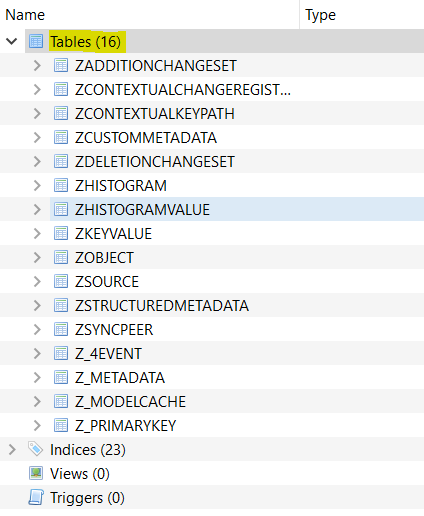 Using the DB Browser for SQLite, we can open the knowledgeC.db database and look at the structure. The database has many tables with many columns. Note: timestamps in this database use the Mac Epoch time (01/01/2001 00:00:00 UTC). Three tables are of particular interest and they store the useful and valuable information for an investigator. For application usage information, we can run the SQLite query below where “/app/inFocus” type will provide what application is being used at a given time. Note: the application usage is only for GUI-based applications. 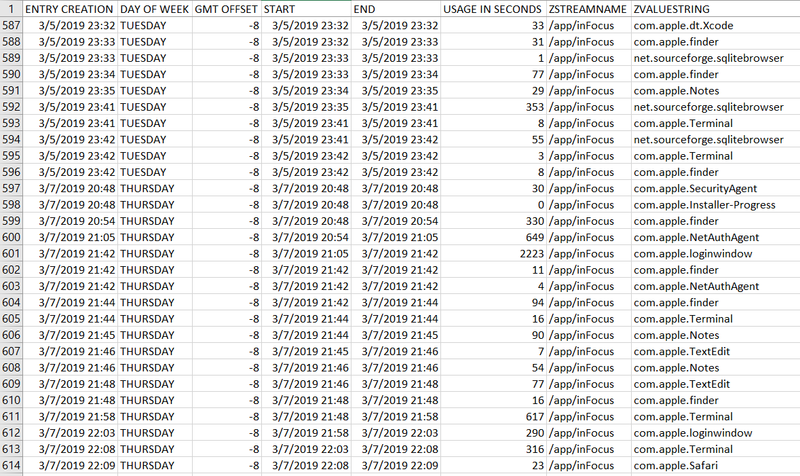 User attribution is an issue as this data is from system context database on macOS. For application activities, we can use “/app/activity” stream type to add more context. 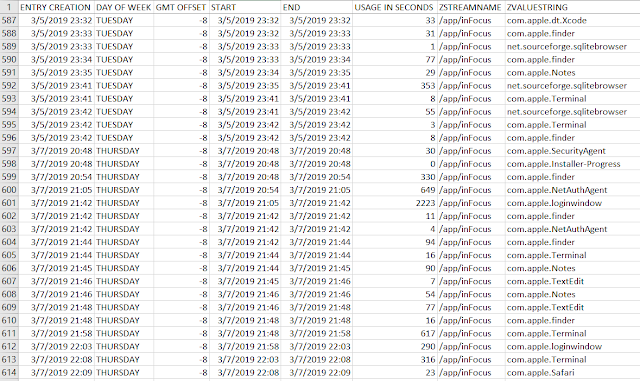 Even though I did edit the note, activity type data is not populated. Further testing is required for this. 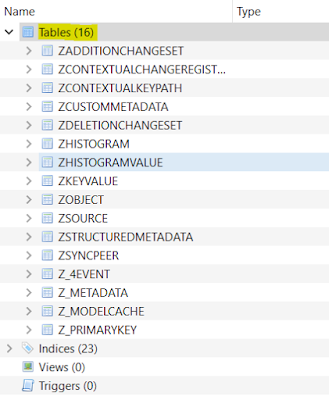 Note: ZSTRUCTUREDMETADATA table has more than 100 columns which is worth looking into to see what data the apps are populating in this table. For Safari history information, we can run the same query as the previous queries. Note: if the user clears the browsing history, these entries get removed too. Private Mode browsing does not show up either. For user correlation, we can run the SQLite query on the user context knowledgeC.db database. There are a lot more testing to be done as this database contains a lot of information.